Mothers, don’t let your babies grow up to be bassists. They’ll beat it with sticks; they’ll scrape it with the end of the bow; they’ll push a wooden spoon through its strings and then make it twang and buzz... Or maybe they will grow up to be Chris Bates or Adam Linz. Maybe all the scrapes and slaps and whines will somehow fit together in a flurry of pitches, glissandos, flutters and static crackles. Maybe they will grow up to play free-form symphonic poems with a percussionist who knows no limits to the universe of created sound, someone like Tatsuya Nakatani. And maybe they will pull in an audience that would overflow a similar space in New York. Tatsuya Nakatani is touring cross country with a van full of traditional and invented percussion, including drumset, hanging gongs, hand-held cymbals, singing bowls, bells, and a variety of wood and metal weaponry. 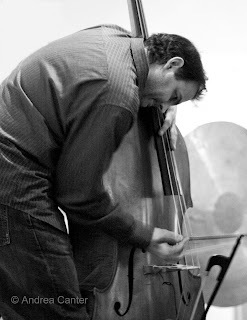 His organic creations infuse jazz, rock and noise with the space and beauty of traditional Japanese folk music. He appeared at the always on-the-edge Clown Lounge in St. Paul last year, and returned to the Twin Cities for two nights with some of the area’s most inventive musicians, Milo Fine on January 20th (Art of This Gallery) and Chris Bates and Adam Linz on January 21st (Rogue Buddha Gallery). And despite recent suggestions from the uniformed press that jazz in the Twin Cities is both “hard to find” and “hard to understand,” jazz seems to be growing a broader audience, with swinging vocalists now appearing in bars and restaurants in the farther reaches of the Metro while free improvisers like Bates, Linz and Nakatani find gigs several nights per week in odd little art gallery spaces, the Dakota Late Night series, and small clubs like the Clown. Nakatani’s second gig this week brought about 75 to Northeast’s Rogue Buddha, and maybe one-third were musicians of somewhat leftward leanings. And maybe as many turned out to see the antics of bassists Bates and Linz as for the experiments in acoustic engineering presented by Nakatani. 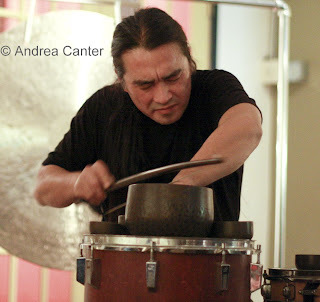 Nakatani performed the first, nearly hour-long set solo, moving methodically, counterclockwise through his percussion array before reversing direction, beginning and ending with the two large hanging gongs. Having heard a demo compilation filled with eerie waves of sound, I was eager to actually see Nakatani in action, to learn how this acoustic menagerie was generated. But one might need a degree in physics to fully grasp the creation of numerous pitches, even polytonal washes that were the percussion equivalent of chords that oscillated like a distant train. Such sounds Nakatani brought forth from the large metal disks by bowing the edges at different points, at different angles—he has been described as “orchestral” with good reason. From the ever increasing intensity of the gongs—varied not only in pitch but in rhythm as well—Nakatani moved to the drumset, a kit of bass, tom and snare expanded by an array of implements that only partially resembled the familiar sticks and brushes of a standard trapset, augmented by “singing bowls” and more bows. Each item had multiple uses, yielding diverse and intriguing thuds, clicks, scrapes, shrieks. Most intense were sounds Nakatani created with his mouth on the drumhead. Having seemingly exhausted the options, he worked his way back through the hanging gongs, gradually lowering the dynamics to a final set of shimmers where each sustain had more space than the last, until nothing remained but space and the last decay fading into the night. The second set featured the trio of two bassists and percussionist, yet it was more like three percussionists setting out on the journey, as each dealt his instrument(s) an assault—from banging the bow like a hammer to jamming a wooden spoon into the strings and then jabbing it to produce a buzz or a thwack, to the hand percussion that created flutters and crackles. Adam Linz was more the straight man at the party, weaving a more classically infused backdrop to the scraping and banging of Nakatani and... the scraping and banging of cohort Bates. In sum the trio created an urban symphony, filled with city sounds of rush hour traffic, commuter trains and busy airspace. Experimental music challenges the mind and ear, at times even the eye. And there may be more unfettered improvisation in the Twin Cities per capita than anywhere in the country—any given week, sometimes more often, we can hear the likes of Fat Kid Wednesdays, Happy Apple, Ellen Lease/Pat Moriarty, Kelly Rossum, Framework, Dean Granros, Ingo Bethke.... And we hear visitors like Tatsuya Nakatani who introduce us to more ways to appreciate sound and who bring out the best and most innovative in our home grown musicians like Chris Bates and Adam Linz. Photos: (Top) Tatsuya Nakatani on solo percussion with a "singing bowl" at Rogue Buddha; Chris Bates sawing away at his bass during the trio set on January 21st. Photos by Andrea Canter.